is a senior lecturer in the department of Land of Israel studies and archaeology at Bar-Ilan University, Israel. He is the author of Learning in a Crusader City: Intellectual Activity and Intercultural Exchanges in Frankish Acre, 1191-1291 (2018). He lives in Jerusalem. On 15 July 1099, the armies of the First Crusade, which departed from their European homelands about three years earlier, broke into Jerusalem and conquered it. This marked the beginning of an almost 200-year period in which the Holy Land was ruled by a Latin Catholic elite. Latins arrived for a wide range of motives, contributing to the development of what is referred to in scholarly discourse as ‘Frankish society’. It is often assumed that the Western population that settled in the Holy Land had very little interest in learning. Thus, for example, the late British historian Steven Runciman wrote in his influential A History of the Crusades (1951-54) that the society of the Crusader states, including the Kingdom of Jerusalem, ‘consisted almost entirely of soldiers and merchants, [and] was not fitted to create or maintain a high intellectual standard’. And the German historian Hans E Mayer has argued that, except in the field of feudal customary law, ‘the Franks contributed little or nothing to the advancement of science and learning in the Middle Ages’. And yet, it now seems that the Kingdom of Jerusalem did, in fact, make its own important cultural contributions. In 1281, a certain John of Antioch gave a beautiful codex to a Hospitaller knight named William of Santo Stefano. At the heart of the precious volume were French translations that John had prepared of two Latin works dating to the days of ancient Rome: Cicero’s De inventione and the anonymous Rhetorica ad Herennium. 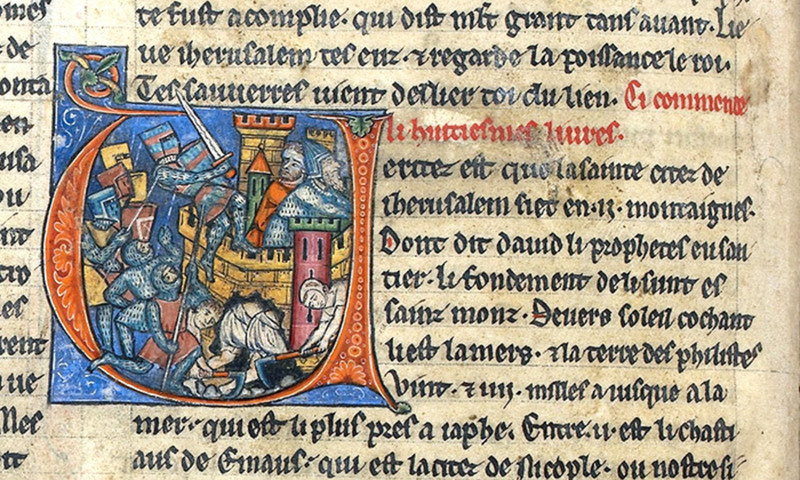 In the production of these translations, John was not only fulfilling the request of an important knight but also making a significant step in the history of the French language: at the time, translations from Latin into French were rare and innovative, and never before had a complete Latin text on rhetoric been translated into French. Furthermore, to these translations John appended one of the earliest vernacular treatises on logic. But the most surprising detail concerning this book is that it was produced thousands of kilometres from the contemporary centres of Western learning, in a port city that then served as the capital of the Crusader Kingdom of Jerusalem: Acre. An additional text that is particularly useful in order to get a glimpse of the intellectual arena that developed in the Kingdom of Jerusalem is the Notitia de Machometo or ‘Information about Muhammed’. This treatise was composed in 1271, also in Acre, by a Dominican named William of Tripoli. It was dedicated to Teobaldo Visconti, a prominent churchman who arrived at Acre on pilgrimage, and, while in the city, was notified of his election as Pope Gregory X. William writes that his reason for compiling this text was that he understood that Teobaldo was interested in Islam. This led him to produce an impressive survey of Islamic history, custom and theology, which includes numerous Quranic passages in (mostly accurate) Latin translation, as well as considerable information that was very hard to come by at the time in Latin Christendom, for example a precise account of the Muslim prayer. Carefully reading the Notitia, it becomes clear that William must have consulted various texts, some of which are no longer extant. Beyond texts, William also made use of informants, at least some of whom were Eastern Christian, probably Copts. The circumstances of the Notitia’s writing show that certain milieus working in the Kingdom were considered as holding high-quality information about Islam and, indeed, that some groups, such as the Dominicans, were curious about the rival religion, and knew Arabic well enough to produce precise translations of Quranic sections. We can also see the importance of the contact between Latins who spent long years, even a lifetime, in the Latin East, and those who stayed there only briefly, both for the development of knowledge and learning in the Kingdom of Jerusalem and in the West. It was this contact that triggered the writing of the Notitia, as well as other works, and it was also such an exchange that brought the Notitia to the West, where it was copied and re-edited. Such contacts also brought updated knowledge and new intellectual trends, such as the rising popularity of academic Roman law, to the Crusader Kingdom of Jerusalem. That William used texts which we no longer have is also significant: given the violent end of the Kingdom of Jerusalem, it is clear that many volumes that once circulated there were lost forever. Studying this cultural environment, one should be careful deducing from the small number of extant texts that, therefore, little learning took place. Furthermore, one should read the surviving texts carefully searching for clues to works that have not reached us. When this is done, it becomes clear that the Kingdom of Jerusalem had mechanisms for the preservation and transmission of knowledge of Oriental culture acquired by previous generations. In the Notitia, a set of Western Marian legends was translated from Latin or French into Arabic, and subsequently adopted by the Coptic and Ethiopian churches. At the same time, the fact that the Notitia reveals hardly any evidence for direct contact with Muslims is also crucial in understanding the cultural history of the Kingdom. The Muslims’ encounter with the Latins of the First Crusade might have left such a bitter taste among the former that they possibly tended to refrain from all unnecessary give-and-take with the Franks, even long after the situation stabilised. The Frankish conquest also seems to have led to the departure of the Muslim elite from the territories taken, making it difficult for the Franks to find Muslim intellectuals with whom to communicate. Finally, while the Muslim territory in which the Latins established the Kingdom of Jerusalem did not lack scholars and learning, it seems that this pre-Crusade intellectual arena was limited, more or less, to the fields of Islamic studies. This would explain why the Latins who arrived to this region felt that they had little to learn from the Muslims they met. As their names imply, John of Antioch and William of Tripoli were likely both natives of the Latin East, and it was there that they received their education. Both wrote in the Kingdom of Jerusalem, producing works that were innovative and original, even in comparison with contemporaneous European culture. They could not have achieved this without a suitable environment. John was led to translate the De inventione and the Rhetorica ad Herennium on William of Santo Stefano’s request, and William of Tripoli would not have been able to produce the Notitia without benefitting from knowledge acquired by other friars. Clearly, this intellectual arena had its limitations, most notably, the limited degree of exchanges with Muslims. At the same time, however, the circumstances that characterised the Latin East also contributed to the development of a unique cultural world. For example, the experimental attitudes toward the French language, which led to, among others, John of Antioch’s pioneering translations, were probably the result of the limited availability of Latin teaching and expertise in the Kingdom. The Kingdom of Jerusalem was no intellectual desert. While it had its limitations, and while it might justly seem disappointing to us that the potential it theoretically had to create a cultural bridge between East and West was not fulfilled, it is worthy of attention as part of the history of the Crusades and, more widely, of the relations between East and West in the Middle Ages.